Last modified on June 30th, 2018 by Vincy. CLNDR Plugin is used to create calendar interface in a web page. In a previous tutorial, we have seen how to create calendar UI using PHP. The CLNDR is the jQuery plugin used to create calendar UI without specifying HTML markup. The calendar view created by this plugin is mapped with mouse events to go back and forth with the calendar day, month and year. In the calendar UI, the dates that have events are highlighted. The events stored in the database table are retrieved by selecting a date from the calendar UI. An AJAX function will call PHP to fetch events on the selected date. PHP code will respond with a JSON data to the AJAX call. In the AJAX success callback, the JSON data response is parsed and displayed to the browser. In the landing page, a div container is used to plot the output calendar UI created by the CLNDR plugin. This target DIV container’s id is used while initializing the CLNDR plugin. Also, a div element is used to display events based on the selected date. Initially, the event container will be empty and dynamically loaded by AJAX on selecting a date. This code shows the HTML containers used to load dynamically created calendar UI and to display event. This code is used to initialize CLNDR library function by setting parameters. In this example, the CLNDR options like events, clickEvents are used. The events option will have the available event array. This will be useful to highlight the dates of the calendar that have events. On the click event of the calendar element, an AJAX call will be sent to the getEventByDate.php by passing the selected date. PHP receives the date param and fetches events from the database. The getEventList.php file is used to fetch all the available events to highlight the event dates. The getEventByDate.php is to fetch events on a particular date. The code for these files is listed below. The following SQL script is used to deploy event database in your PHP environment to run this example. This screenshot shows the calendar created by the CLNDR plugin. 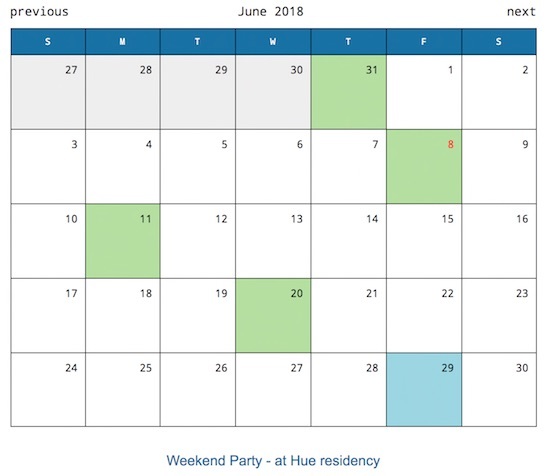 The highlighted days are containing events in the database. On clicking the highlighted days the events on that day will be listed below the calendar.